We all have our own secret family recipes along with our go-to favourites! We wanted to share some of our client’s favourite recipes that they enjoy making for family and friends, in their new Kitchens that we had the pleasure of working with them to create. The team at LSKC, we have our own recipe that’s our favourite. “Crispy Peanut Butter Chocolate Chip Cookies”. Best part about these: they’re vegan and gluten free. So the guilt isn’t too high if you eat more than one. Don’t worry, we won’t judge if you do! In a small bowl, mix together the ground flax and water. Set aside for a few minutes so it can thicken. With an electric mixer or in a stand mixer, beat the buttery spread and peanut butter until combined. Add both sugars and beat for 1 minute more. Beat in the flax mixture and vanilla extract until combined. Now, beat in the dry ingredients (baking soda, baking powder, salt, oat flour, and almond meal) one by one. Stir in the chocolate chips, reserving about 1 tablespoon for pressing into the top of the dough balls. Shape 1-inch balls of dough (smaller than golf balls) and place on the baking sheet 2 inches apart. 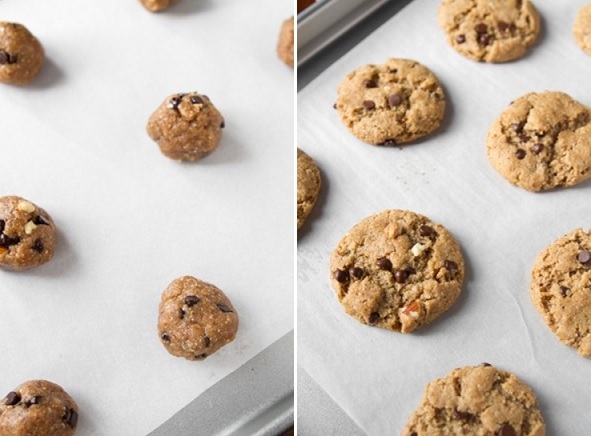 You can also use a retractable cookie scoop. 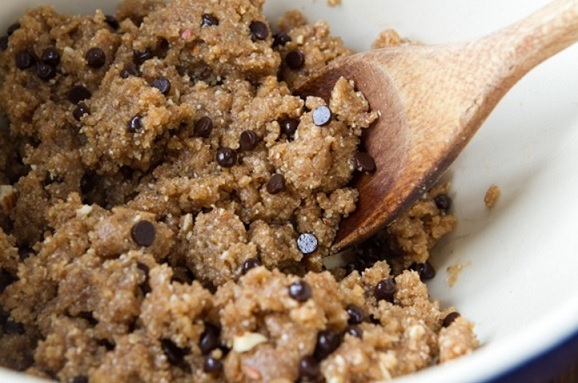 If chocolate chips aren’t sticking to the dough, just press them in with your fingers. There is no need to flatten the balls as the cookies spread out while baking. Press reserved chips into the tops of the dough balls. Bake for about 11 to 13 minutes until spread out and lightly golden. The cookies will be very soft coming out of the oven, but they will crisp up as they cool. Allow to cool for 5 to 10 minutes on the baking sheet and then transfer to a cooling rack for another 10 minutes. * Be sure to stir the peanut butter well before using. Also, avoid using the dry nut butter that’s often found at the bottom of the jar. 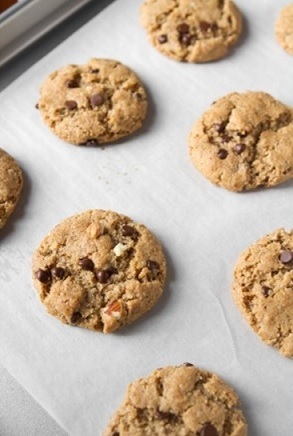 It’s simply too thick and dry for this recipe and will result in cookies that don’t spread. ** For “pretty” cookies, reserve 1 tablespoon of chocolate chips for pressing into the tops of the dough balls before baking. I use Enjoy Life mini chocolate chips.